Atherosclerosis is a disease of the arteries characterized by the accumulation of plaques of fatty material on the inner walls of your arteries. Symptoms may include chest pain, pain in legs or arms, shortness of breath, fatigue, confusion, or muscle weakness. 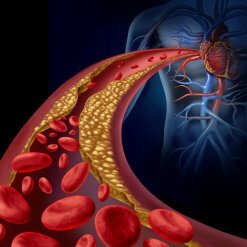 By the age of 40, about half of us have cholesterol deposits in our arteries that can lead to atherosclerosis.